Motivation, Disability Awareness, Faith, Humor! 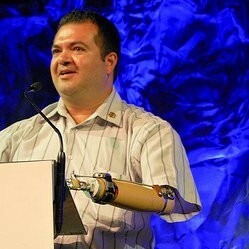 Author, speaker, business owner, actor who was born without three limbs. Alex has carried the Olympic Torch, graduated from Notre Dame, appeared in Hollywood movies, published 3 books, worked in Major League Baseball, & more. Inspirational & funny! Alex Montoya is a business owner, author, speaker, & actor who has overcome being a triple amputee from birth. His message is empowering, humorous, and uplifting!